Chief Executive Officer District Education Authority Sialkot No 4979 /Admin Dated 3/12/2018 regarding teachers code of conduct and Issues in Sialkot Punjab Education School. 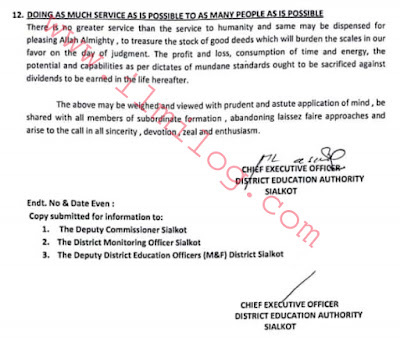 The District Education Officer (SE) the District Education Officer (EE-W) the District Education Officer (EE-M) Sialkot. 1. ENROLMENT CAMPAIGN The admission in Nursery Class presents the somber state of affairs when seen against the stipulated target. The campaign has not culminated yet, hence serious efforts need to be made to enroll more children. Likewise, admissions in other primary and elementary classes also do not augur well and therefore those resting on their laurels will have to Wave for the achievement of targets come what may. 2. IMPROVEMENT IN QUALITY INDICATORS The results of terminal classes during the last three years portray declining standards of education in public sector schools in Sialkot district. 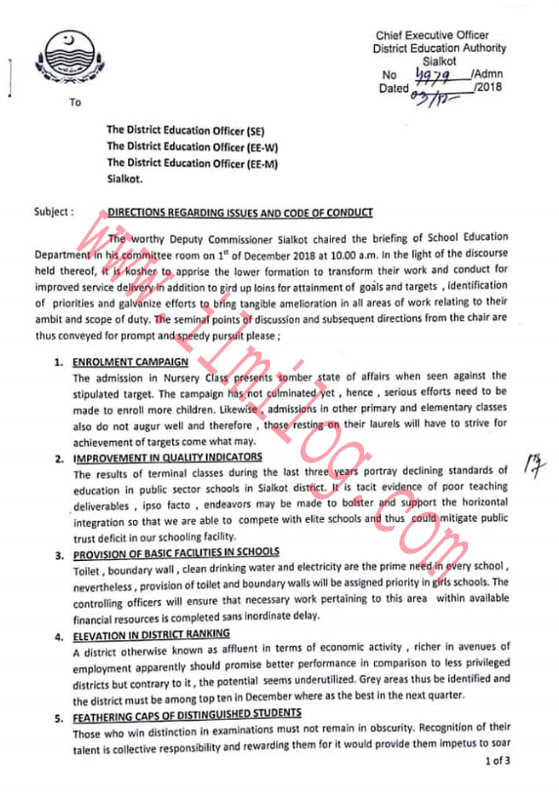 It is tacit evidence of poor teaching deliverables ipso facto, endeavors may be made to bolster and support the horizontal integration so that we are able to compete with elite schools and thus could mitigate public trust deficit in our schooling facility. 3. 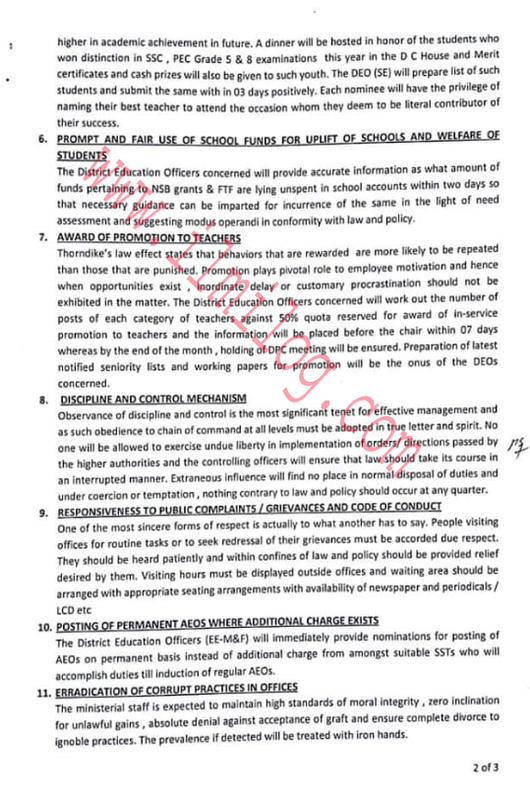 PROVISION OF BASIC FACIUTIES IN SCHOOLS Toilet, boundary wall, clean drinking water, and electricity are the prime need in every school, nevertheless, provision of toilet and boundary walls will be assigned priority in girls’ schools. The controlling officers will ensure that necessary work pertaining to this area within available financial resources is completed sans inordinate delay. 4. ELEVATION IN DISTRICT RANKIN A district is otherwise known as affluent in terms of economic activity, richer in avenues of employment apparently should promise better performance in comparison to less privileged districts but contrary to it the potential seems underutilized. 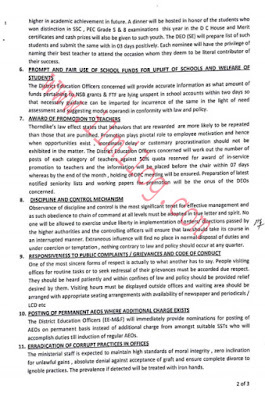 Grey areas thus are Identified and the district must be among the top ten in December whereas the best in the next quarter. 5. FEATHERING CAPS OF DISTINGUISHED STUDENTS those who win distinction in examinations must not remain in obscurity. Recognition of their talent is a collective responsibility and rewarding them for it would provide the impetus to soar 1 of 3.